From Australia's favourite storyteller comes a story, within a story, that shows us the extraordinary power of true love and solves a decades-old mystery. While on a history excursion, an ill-assorted group of four kids and their teacher are left on a country road when their mini... read full description below. From Australia's favourite storyteller comes a story, within a story, that shows us the extraordinary power of true love and solves a decades-old mystery. While on a history excursion, an ill-assorted group of four kids and their teacher are left on a country road when their minibus breaks down. At the suggestion of a friendly tow-truck driver, the five take shelter in a nearby old, deserted mansion. There they find a little old desk with a secret drawer. Inside the drawer is a book containing a handwritten story and a series of vivid, strangely lifelike paintings. 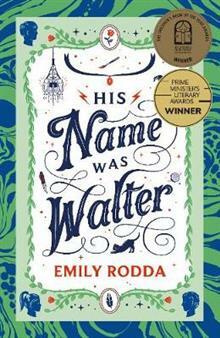 The book is called His Name Was Walter. The story begins: 'Once upon a time, in a dark city far away, there lived a boy called Walter, who had nothing but his name to call his own.' And so begins the tale of Walter - his lonely childhood, his flight from the haunted streets of the city, his discovery of Magda the witch, his quest to find Magda's lost daughter, and his meeting with the love of his life, the mysterious, tragic girl he calls Sparrow. As the night closes in around them and the story of Walter and Sparrow unfolds, the kids read it avidly.. Slowly the outer and inner stories begin to mesh. Slowly the story of Walter draws the five members of the group together. And in the end every one of the five plays a vital role in the uncovering of the truth.